Welcome to Wisconsin Aviation - Madison, Wisconsin! In 1939, Louis Wuilleumier and partner E. Merritt Anderson formed the Four Lakes Aviation Corporation. For the sum of $25 a month, they rented land at the southeast area of Madison, known as the Royal Airport. In 1940, Wuilleumier bought out his partner, Anderson, and now exclusively owned Four Lakes Aviation Corporation. During World War II, Four Lakes Aviation became a contract school and provided civilian pilot training and war training service for the United States government. After the war, in 1946, Four Lakes Aviation was authorized to provide training under the GI Bill to veterans of the WWII and Korean Campaign. 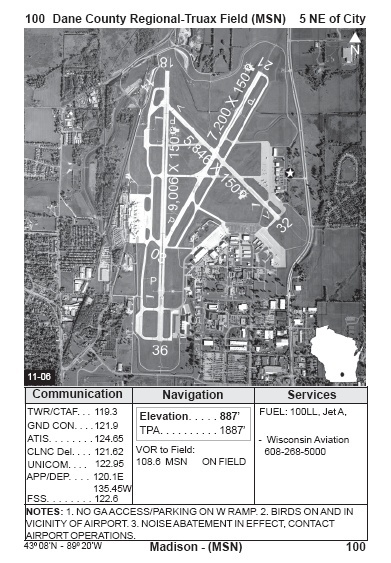 In 1951, Wuilleumier moved the operation to the Madison Municipal Airport, now the Dane County Regional Airport. He expanded the operation and acquired a dealership with the Piper Aircraft Corporation. Louis, his wife Lois, and sons Rick and Robert made the operation a successful family affair. 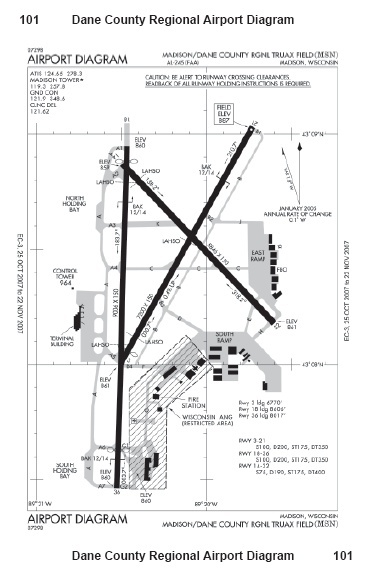 During the following years, other fixed-base operators opened on the south side of the airport: DEC Air, Mobility, and Madison Air Service, to name a few. Then in 1967, upon failure of these other FBOs, Claude Frickelton and his partner, Marv Kramer, opened Frickelton School of Aeronautics. They immediately obtained a dealership with the Cessna Aviation Corporation and Phillip's 66 Oil Company. Four Lakes Aviation provided fuel from the Shell Oil Company at this time, and the fuel service was split between the two FBOs. During these times, corporate aviation was growing at the airport with companies such as Oscar Mayer, Gisholt Machine, Red Dot Products, Dairy Equipment Corp., Ray-O-Vac Corp., and others. In 1980, two entrepreneurs approached Louis from the Milwaukee area and offered to buy Four Lakes Aviation. The transaction was consummated, and during this time Sid Julson was hired to manage the operation. Then in 1987, the new owners decided they could make more money in other investments and asked Louis if he would buy back the operation. He did and Sid Julson entered in as a partner. The business grew under this arrangement. During the same time, Wisconsin Aviation, Inc., under the direction of Jeff Baum, CEO and owner, was emerging as a key player in the Watertown, Wisconsin, area. Baum and a partner purchased the defunct FBO at the Watertown Municipal Airport. By 1983, Wisconsin Aviation was growing into an established aviation business and now had procured a second FBO at the Dodge County Airport in Juneau, Wisconsin. In the next few years, Wisconsin Aviation opened an affiliate facility at Air Sinclair, in Milledgeville, Georgia, near Atlanta, Georgia. In 1987, a corporate maintenance operation was added at Watertown to provide parts and service for its growing charter and rental fleet of aircraft. Further expansion encompassed the formation of another affiliate, Wisconsin Aviation-Europe, in Germany, presently in operation. On January 1, 1994, Madison's Four Lakes Aviation was purchased by Wisconsin Aviation, Inc.